Friday, February 11th, was a magnificent day for gifted. We filled the Columbia Room to capacity and beyond with enthusiastic parents and children. More than 45 legislators were contacted. The lime green scarves announced that supporters of Highly Capable Programs were out in force. Thank you, Puyallup ABC. The crowd was addressed by Rep. Pat Sullivan and Rep. Bruce Dammeier, two of our staunchest supporters in the House, and by Gayle Pauley, Director of HCP at OSPI. Kelly Munn of the League of Education Voters spoke on effective advocacy. Also dropping in were Rep. Norm Johnson whose district is west of Yakima, Rep. Terry Nealey, whose district includes Pasco and Walla Walla, and Rep. Reuven Carlyle of Seattle, who stopped by for information and to talk with advocates. Thank you to everyone who came to Olympia on Friday. We had delegations from Wenatchee to Stevenson down on the Columbia River, and all points in-between. Ages ranged from 2 1/2 months to grandparents. Many of those in Olympia took home the STEM Report by the National Science Board. It is a powerful statement about the value and need for gifted programs. Be sure to read it and pass it on to local school officials. If you took pictures of your meeting with a legislator, consider sending him/her a copy as part of an electronic thank you. And share your pictures on our Facebook page (http://www.facebook.com/wagifted) or send us a copy so we can use them too. Thanks. The Supplemental Budget (which continues funding for HCP through the end of this fiscal year) is due out of conference any day now. Substitute HB 1443, Sections 208 and 209, as voted out of committee, gives us something to build on in the future. We will keep you informed of its progress as it moves through the House and Senate. SB 5475 is scheduled for executive session in the Senate K-12 Committee on Wednesday morning. This is the bill which would delay the inclusion of HCP into basic education until Sept. 2013. There are many amendments to be voted on but their impact on HCP is unknown. From the K-12 Committee the bill will go to the Senate Ways & Means where it is scheduled for a public hearing on Thursday. We will testify; the message depends on what emerges on Wednesday from the K-12 Committee. This bill needs to make its way through the Senate and then repeat the process in the House. Finally, there is the biennial budget. Experienced observers of the Legislature don’t expect it to appear until the very end of March or even early April. We are counting on your continued participation in our efforts to influence legislation and regulations for HCP. Please focus your advocacy on behalf of education funding in general and HCP funding in particular. Our messages need to be positive and avoid comparison to other programs as each program is unique and funding sources are different. We need to make our case on our own merits, not in comparison to or competition with any other programs. Short, succinct messages are the most effective. We will post samples for your use. Legislators continue to tell us that those who don’t make a concerted effort to contact them are not going to be heard or heeded. Last reminders before Gifted Education Day. 2. A contact sheet to fill out and hand in after your appointment with your legislator(s). These sheets will NOT be available on Gifted Ed Day so print out and bring with you as many as you need for all your appointments. If a group is meeting with a Legislator, only one form for the entire group is needed so designate one person to write it. You can also copy the text below if you’d rather send us your contact report through e-mail. Send your contact reports to wagifted@earthlink.net. Is the Coalition expected to follow up with this contact? Your email address or other contact information in case we need to check with you. DON’T FORGET TO SEND A HANDWRITTEN THANK YOU! One from each member of the group is best. 4. If you’ve not already drafted a letter to your legislators, please see the sample letters we have posted separately here on our blog for some ideas. 5. Some of you are interested in having your students attend a committee session or observe a floor session. Only one committee concerned with education issues is scheduled for Friday, Feb. 11. We will have information on possible floor sessions in the Columbia Room. Schedules are always subject to change at the last moment. HB 1168 – Concerning career and technical education. HB 1710 – Creating a strategic plan for career and technical education. HB 1524 – Recognizing the international baccalaureate diploma. HB 1594 – Concerning the membership and work of the financial education public-private partnership. HB 1600 – Concerning elementary math specialists. HB 1669 – Regarding the educational opportunity gap. HB 1829 – Creating a division of Indian education in the office of the superintendent of public instruction. HB 1163 – Concerning harassment, intimidation, and bullying prevention. HB 1599 – Establishing the pay for actual student success dropout prevention program. HB 1519 – Regarding school assessments for students with cognitive disabilities. Parents and Friends of Highly Capable Children – We now need your help to save your child’s highly capable education for the next two school years, 2011-13. Two proposals from the Governor would eliminate all Highly Capable Program (HCP) funding for this period. Meanwhile, the Governor has proposed increasing funds for other education programs during 2011-13. We’re asking the Legislature for equal treatment: Education programs must be funded equitably and proportionally. These are basic education dollars for highly capable students and programs. The mistaken perception that gifted kids are all upper-class, white, hardship-free, and disability-free has created an image hurdle for us in the Legislature. If your family’s story can balance any piece of that image, please include it! We urge you to contact your legislators by Friday, February 11 – Gifted Education Day in Olympia. Two sample letters are below. Remember to address emails, sign your name, and add your child’s story. Thank you! Your efforts to save HCP funding for the current school year have been working – now let’s do the same for the 2011-12 and 2012-13 school years! The Legislature must now honor its own mandate to make the highly capable program (HCP) a part of Basic Education beginning in September 2011. Currently, SB 5475 and the Governor’s proposed 2011-13 budget target HCP students for funding elimination, while protecting and increasing funding for other education programs. The Legislature must fund all students’ education programs equitably and proportionally. 1. SB 5475 must be amended to make HCP part of Basic Education as scheduled: beginning in September 2011. As currently written, SB 5475 would postpone the inclusion of HCP in basic education for two school years – until 2013. However, SB 5475 would advance other reforms from last session on schedule, making other unprotected education programs part of basic education beginning in 2011. 2. The Governor’s 2011-13 budget must be amended to fund HCP students. Currently, the Governor’s proposed budget eliminates all funding for HCP students. However, the Governor’s proposed budget would increase funding for students of other unprotected education programs. Highly capable students come from all cultures and socio-economic backgrounds, and from special education classrooms. Targeting highly capable students for funding elimination is inappropriate. It is neither equitable nor proportional. It hurts school districts that are already fiscally weak. It denies these children their right to a free and appropriate public education, and its impact is most severe on highly capable children who are middle-class, lower-middle-class, and low-income. Targeting highly capable students for funding elimination is the opposite of how our competitor states are handling their own budget crises. It does not put our state on a path to economic recovery – it knocks Washington further off course. Washington must press forward with its mandated educational reforms, and must do so equitably and proportionately. This is crucial for creating a future for all our children and building economic vitality in our state. I have a project that I am hoping all of you will embrace. I think you will because you’ve all been amazing at calling and emailing your Representatives with great creative messages! I would like to show our elected officials the bright shining faces of Hi-Cap kids (teachers, family members!). So what I am asking is for you to make a sign with a message from you or your child (see attached photo for my daughters!) 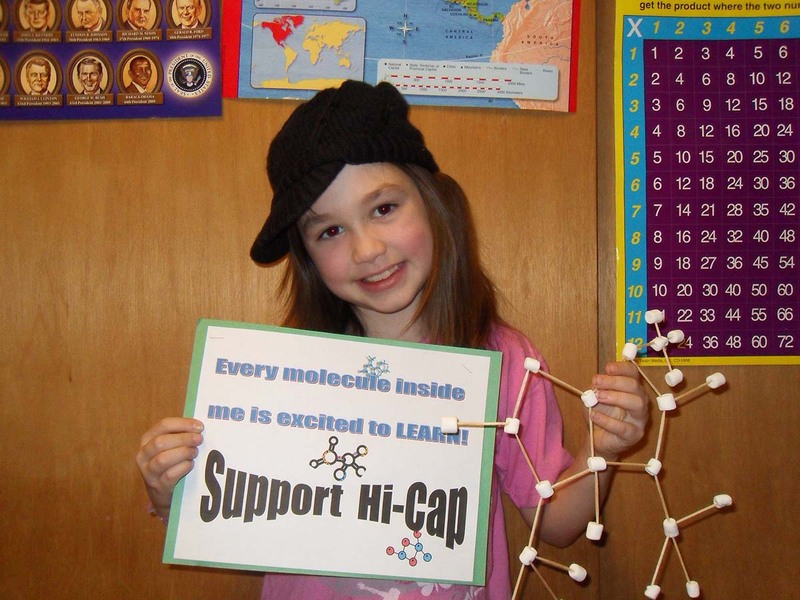 and also include somewhere on the sign “Support Hi-Cap” so that we will have a consistent message. Please make sure that you can read the sign. Also many parents have asked about having their child write hand written notes. If you or your child would like to do this you can fax them to me at 1-866-276-1565 and I will create a PDF with them and add them to the photos. (NO LAST NAMES PLEASE) The fax number is an efax – the faxes goes right into my email. Upload your pictures to our Flickr group — http://www.flickr.com/groups/hicap. You can upload high quality photos to this site which will be good if I need to print them! You can share them through the Washington Coalition for Gifted Education’s Facebook page (http://www.facebook.com/wagifted). Or e-mail them to me with the email title “Hi-Cap Picture” I am hoping to get at the very least 100 pictures! Can’t wait to see how creative you are! Help spread the word and forward this email to other parents/teachers or students involved with Highly Capable or gifted programs in Washington State! Please get your pictures to me by February 14th! It is my hope to print out the final product in a book form that I can give to the Governor. Parent of 3rd and 4th Grade Hi-Cap Students in the Kent School District.